Whether you're preparing your contact center to roll out a new mobile app, performing an overhaul, or just fine-tuning certain processes, a Contact Center Roadmap will take you from where you are to where you need to be. Learn how to use technology as a competitive advantage and optimize your contact center for customer care success with this free eBook. Don't waste another opportunity to gain a competitive edge! 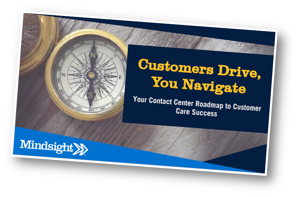 Download Mindsight's free book: Customers Drive, You Navigate: Your Contact Center Roadmap to Customer Care Success to gain expert insight on the contact center roadmapping process and get a head start on your strategy today. Fill out the form below to get your ebook.